Golden Age comics tended to romanticize American Indians, which is why there were at least two Native superheroes in the 1940s. I'm sorry to say I understand why both were forgotten. The Bird Man, winged hunter of the plains and descendant of an ancient Native American god, was gifted with the ability to fly and the keenness of a bird of prey. His wings were said to be as durable as steel. 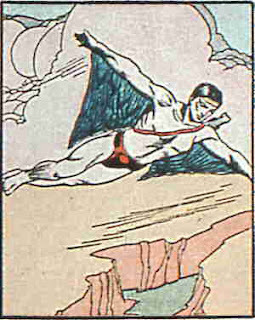 But the art and the writing are bad even by the standards of early comic books, and his costume is as minimalistic as the Sub-Mariner's. The only thing I like about him is his bow and arrow: a long-range weapon makes sense for someone who flies. Seeking to inspire his students, Robert Blake wears a blue buckskin costume and mask, becoming the hero known as Buckskin (or sometimes Buck Skin Blake). Trained by his grandfather, a former Indian scout, he has no powers but is a skilled fighter and woodsman. He was sometimes aided by his trained eagle, Talon. But he had better artists and writers, and perhaps more importantly, a better costume. If I was writing a story using Golden Age superheroes of color, I might find a way to merge these two, maybe by giving the Bird Man Buckskin's costume and pet eagle. Or maybe I wouldn't. The Bird Man and Buckskin are essentially Native versions of Hawkman and Wildcat. They could make a fine team. One of Buckskin's stories (which I hate for its anti-union jingoism) is reprinted here: Four-Color Shadows: Buckskin-Super Mystery Comics-1942.